Team up with Batman, Robin, and more of your favorite heroes as they battle Mr. 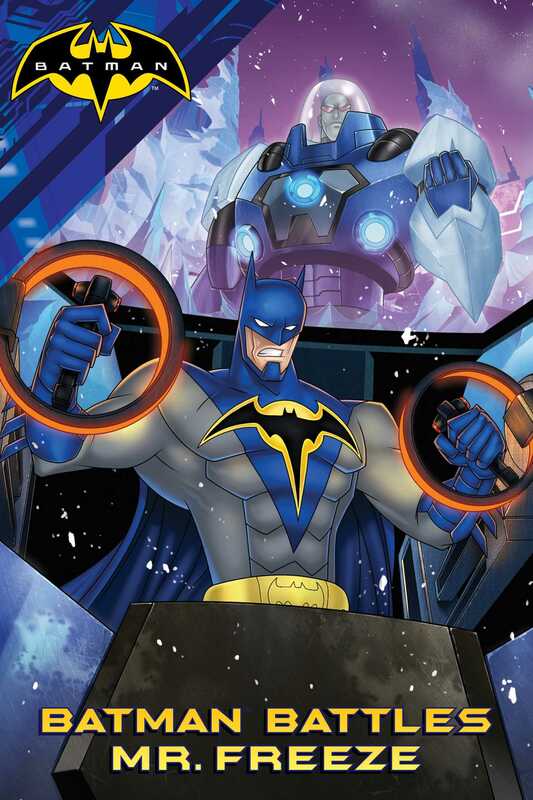 Freeze and the Penguin in this action-packed chapter book retelling of the Batman animated film, Mechs vs. Mutants that comes with full-color images from the film throughout! Gotham City has frozen over, and that’s just the beginning. Mr. Freeze and the Penguin are taking over the planet. First step: jumbo-size Killer Croc and Chemo. Second step: unleash the monsters! While Nightwing, The Flash, Robin, and Dr. Langstrom create all-new tech, Batman and Green Arrow don their mech suits to take on the big, bad guys. It’s a larger-than-life battle, but can machine defeat monster before it’s ice world forever? The people of Gotham City were used to seeing some strange things, but this was the weirdest one yet! The entire city was frozen over. Buildings looked like icebergs. A blizzard blew snow through the streets on a summer’s night. A few hours ago the weather had been sunny and warm. Now it was arctic. To make matters worse, a terrifying monster stomped through the streets, towering above skyscrapers. It was Killer Croc, grown to an impossible size. The Flash and Nightwing raced to save innocent civilians in Croc’s path. They paused when they saw another incredible sight: a giant robot Bat-Mech! “Scanning for target. . . . Acquired,” Batman said from the cockpit of the Bat-Mech, and headed for Killer Croc. The super-villain was surprised when the giant robot smashed into him and sent him reeling. He recovered and returned the attack. The Dark Knight punched the villain with a mechanical fist. Croc staggered backward, but then he rushed the Bat-Mech and pushed it toward a building. The people inside screamed as they fled to safety. Gotham City became a battleground for the two tremendous titans. TWO WEEKS EARLIER . . . It was a warm summer night in Gotham City. Families took time out to enjoy the mild weather. But belowground, in the Batcave, it was business as usual. Robin studied a file of Batman’s greatest foes. He had already encountered the Joker in person, with embarrassing results. As he scanned the holo-displays, the Batmobile roared into the Batcave. “Studying? Good,” Batman told Robin. In a desolate arctic landscape, the Penguin sat in an ice cave and grumbled. Suddenly Mr. Freeze entered the lab. He grumbled as he searched for a particular object. “Solitude! That’s all I ask for. And yet my territory has been invaded!” Mr. Freeze complained. “You mean that new oil drilling platform?” the Penguin asked. Mr. Freeze found what he was looking for. It was a small triangular pod. The device didn’t look like anything important until Mr. Freeze attached it to the back of a small sea creature. The animal grew to tremendous size!